In 2014, Mido is celebrating the 80th anniversary of the Multifort collection that has enjoyed one of the longest production runs in the history of Swiss watchmaking. In honour of this exceptional longevity, the brand is launching the Multifort 80th Anniversary GMT Edition, a characterful timepiece equipped with a second time zone. The model has a classic and timeless elegance that will appeal to frequent travellers and fine watchmaking enthusiasts alike. The silver dial, decorated with vertical Geneva stripes, displays around its edge the names of cities representing the world’s 24 time zones. 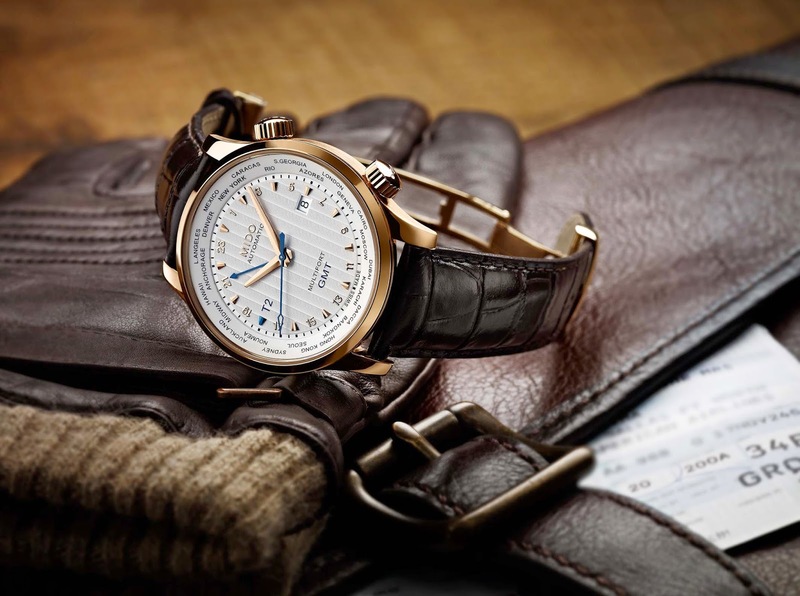 The Multifort 80th Anniversary GMT Edition is a true invitation to travel. Launched in 1934, just two years after the completion of the Sydney Harbour Bridge, the Multifort collection shares some remarkable characteristics with the famous structure: a perfect balance between function and aesthetics. A truth that has stood the test of time, as this year Mido celebrates the 80th anniversary of Multifort production, making this one of the longest-produced collections in the history of Swiss watchmaking. The new Multifort 80th Anniversary GMT Edition will find a home on the wrist of every frequent traveller who appreciates Swiss watchmaking expertise, as this supremely elegant model is endowed with a second time zone. A moving, compartmentalized flange displays the names of cities representing the world's 24 time zones. The second time zone (T2) is set using the screw-in crown at 2 o’clock. The small arrow-shaped hand, activated with the screw-in crown at 4 o’clock, shows the time in the T2 time zone following a 24-hour graduated scale. These two crowns without doubt mark the unique design and resolutely masculine character of this GMT Edition. A true invitation to travel, the Multifort 80th Anniversary GMT Edition has many attractive features. With a 42 mm diameter, its rose PVD-treated steel case houses a dial subtly decorated with vertical Geneva stripes. They evoke the suspender cables of the Sydney Harbour Bridge, a symbol of architectural modernity in the early 1930s. The touches of blued steel on the dial lend an extra touch of sophistication to this model. The dial is protected by an anti-reflective sapphire crystal, treated on both sides and offering perfect readability. The aperture at 3 o’clock displays the date. Both robust and chic, the GMT Edition will appeal to all fine watchmaking enthusiasts with its transparent case back through which the finely decorated automatic movement can be admired, along with an oscillating weight decorated with Geneva stripes and the Mido logo. The Multifort 80th Anniversary GMT Edition is water-resistant up to a pressure of 10 bar (100 m / 330 ft) and has a brown calf leather strap fitted with a folding clasp in rose PVD-treated stainless steel. The model is also available with a stainless steel case and bracelet. weight with Geneva stripes and engraved Mido logo. Functions HMSD + GMT. Adjusted on 4 different positions for a high accuracy. case back, water-resistant up to a pressure of 10 bar (100 m / 330 ft). Diamond polished, seconds hand and 2nd time-zone hand in blued steel.